No hanger appeal – but it looks fine when on! I always like to have a new dress to wear on Christmas Day. 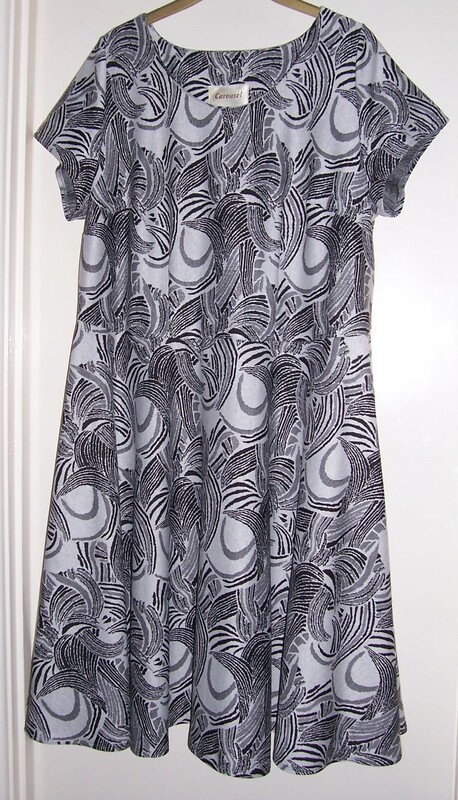 In Franklins sale I found just the right fabric to make a warm version of the TNT Bettina dress. 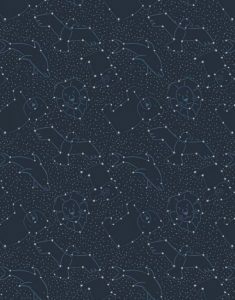 As it was a jersey fabric this would also be a good opportunity to continue my experience of stitching jersey fabrics and using the overlocker for more than simply neatening seam allowances. The fabric was very wide and when I laid it out on my cutting board I realised that the pattern had a pronounced “stripe” in the design which went – unfortunately – across the width of the fabric. That would not do – no width-wise stripes across my bust! As the fabric was quite thick I decided against a gathered or pleated skirt as this would produce too much bulk around the waistline. There would surely be sufficient for my favourite circular skirt. With some “finessing” I managed to lay out the pattern with the grainline across the pieces (so that the design lines were vertical ) but there was just not enough fabric for the ¾ sleeves that I would prefer. Oh well, I can always wear a cardigan! The dress was a very quick and easy sew. The darts were stitched on the regular machine with a small (2.5mm) stitch length. 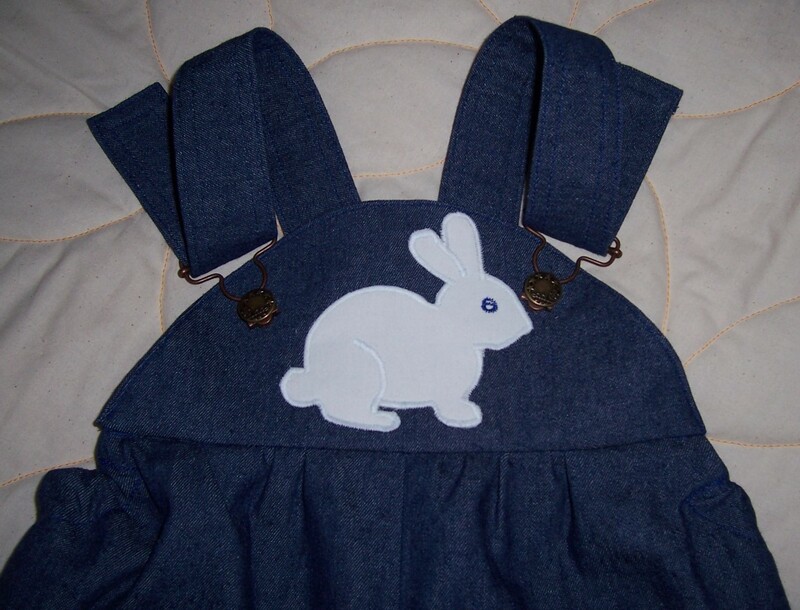 The shoulders were also stitched with the regular machine but “stayed” with a length of plain black ribbon. 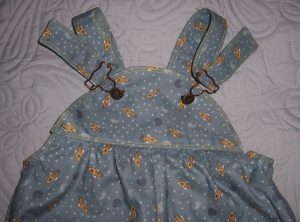 The sleeves were first inserted with a straight stitch and then finished with the overlocker. 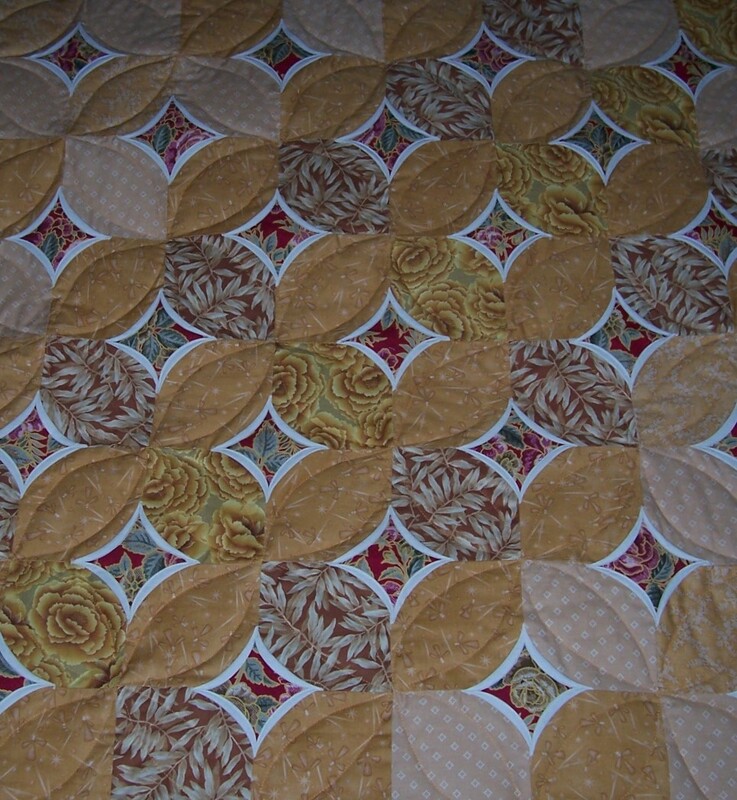 The remainder of the stitching was completed on the 4-thread overlocker. The hems on the sleeves and around the skirt were my usual twin-needle stitching. I have worn the dress several times and received many compliments. So far I have always worn it with a Red long-sleeve cardigan (and Red “Jewel” shoes from Hotter). As the design is in monochrome it should go very well with a wide range of colours. In the future I may also use my other favourite cardigans from Lands End – I have Bright Teal, Yellow, Autumn Gold, Soft Peach and Green. After a meeting with Meg at New Threads Quilt Shop we have now agreed a programme of workshops to be run up to and including June 2017. The first is a Toile making class in January followed in February a class for absolute beginners, returners and improvers. In the class we will be making scissors cases and pin cushions. So…. I needed to make some samples. 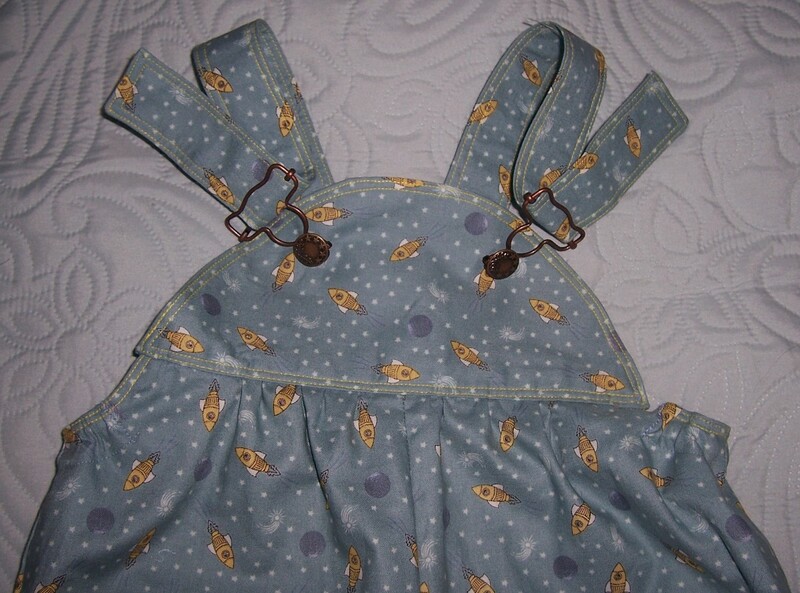 Using a basic pattern from Threads magazine which then I adapted to make more appropriate for beginners, I used some lovely sewing themed fabric from Lewis & Irene called “Threaded with Love”. 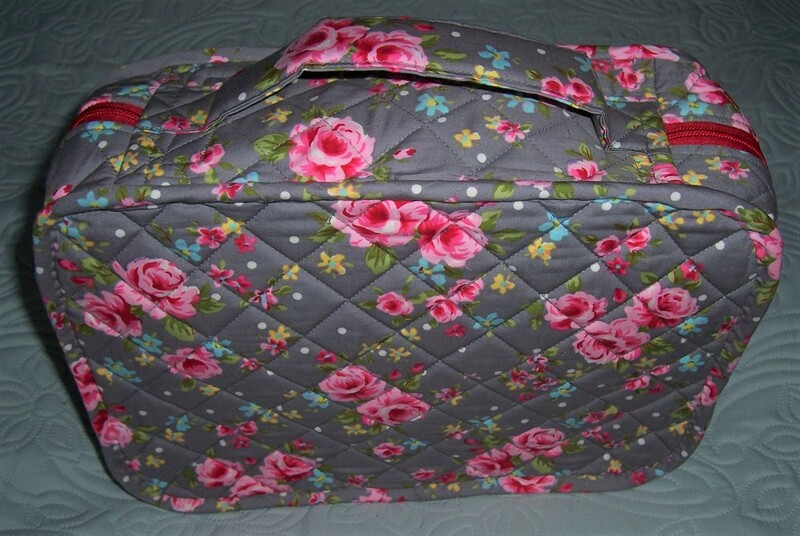 The scissors case is lightly quilted with fusible wadding and can be lined in the same or contrast fabric. 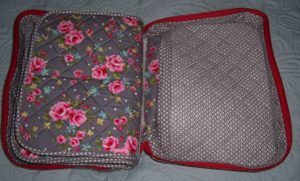 The fastening can be a snap popper (I used my lovely new set of snaps and pliers! 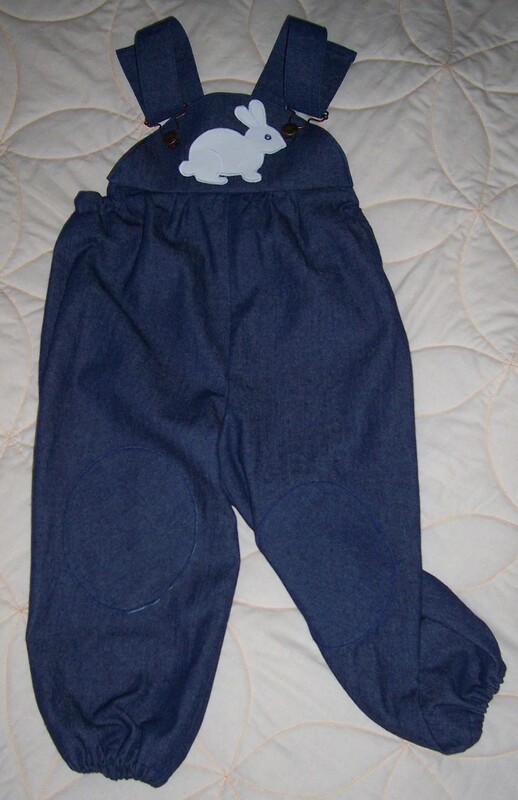 ), velcro, button with buttonhole or loop, or popper. 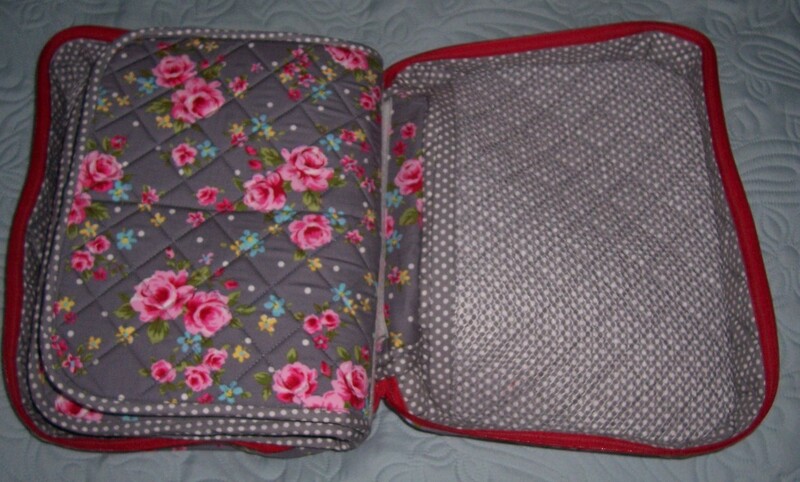 Depending on how you fold the case you end up with the 2 sections either small inside the large or small outside the large l. Personally I prefer the former which then leaves a large area for embellishment if required. I have made the large case in both permutations plus closures of snap poppers on one and button with elastic (hair bungee) on the other. 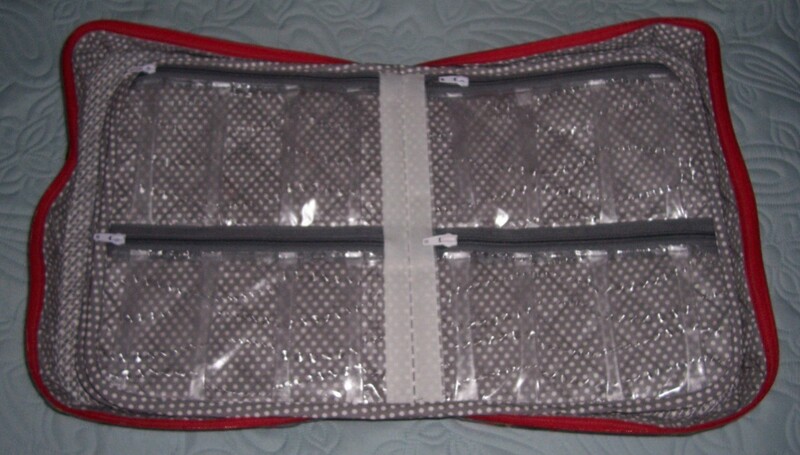 Long ago I hacked the pattern to make a small version of the scissors case which is just the right size for small embroidery scissors or snips. I made a co-ordinating case to accompany the larger cases. Next, onto the pin cushion. 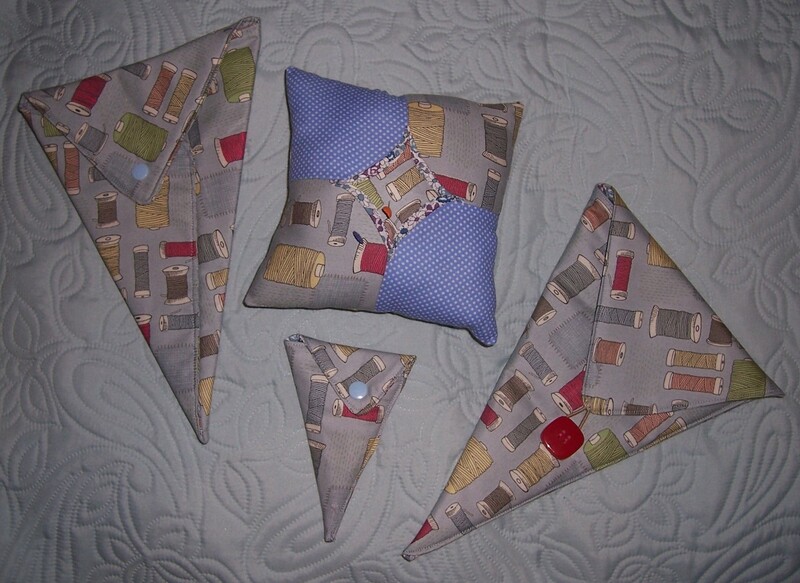 As the scissors case is so basic, I decided that it would be a good idea to “stretch” the students a little and introduce them to one of my favourite patchwork blocks – 3D bow tie with faux cathedral window insert (what a mouthful – I need to come up with a shorter name for the block! 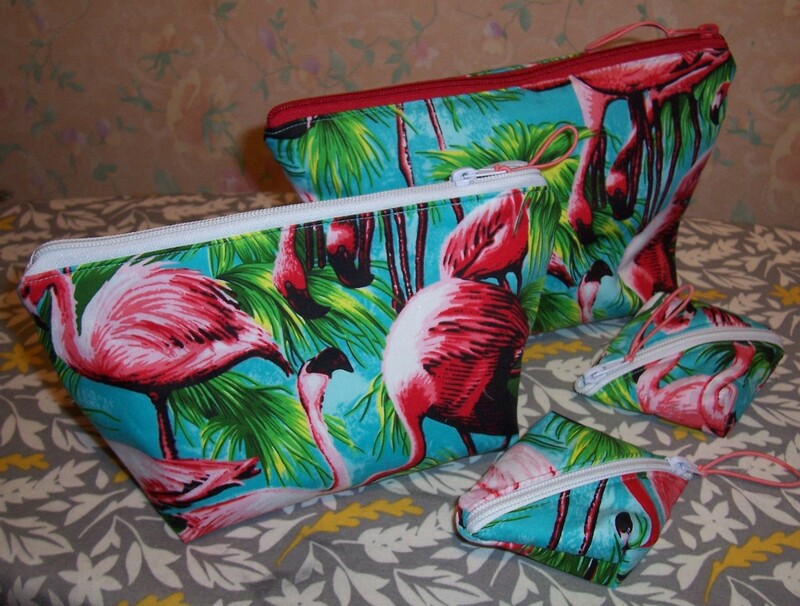 ).The block uses only small scraps of fabric and can be made uses some of the remnants from the scissors cases combined with a couple of other prints. I started out with basic 4 inch squares (subsequently made a second one with 3 inch squares) which made the “fiddling” of the 3D centrepiece a little easier to cope with. 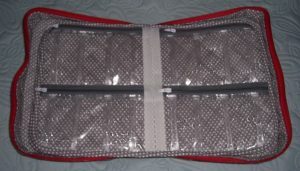 The resultant pin cushion is approximately 7 inches square – a good-sized piece of equipment that will not easily be lost or buried under sewing projects. 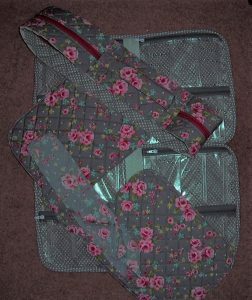 From the left: Large case with small section outside & popper fastening, pincushion, small scissors case with popper, large case with small section Inside & button/loop fastening. 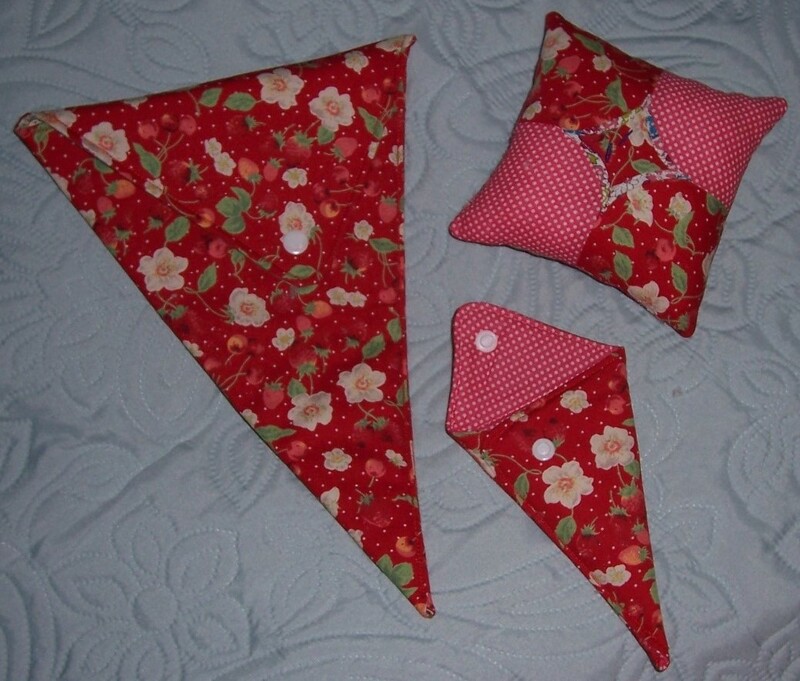 Having completed the samples for the workshop I then retrieved some Red Strawberry print fabric from my stash together with complimentary spot print and made a set to accompany my latest new Brother ® sewing machine. 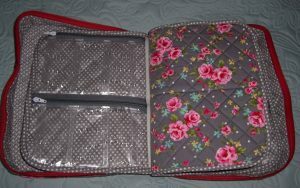 My very good friend Maureen had previously made two of these fantastic cases, one for me and another for Adrienne. Knowing that Maureen had more than enough sewing projects to complete before Christmas I knew that if there was to be one made for Joan, it would have to be me that made it. I had purchased the lesson and pattern from Craftsy.com quite a long time ago – just never plucked up the courage to undertake what I could see would be quite a complicated and involved project. But the desire to make a really lovely gift for Joan was sufficient to stiffen my resolve, to roll up my sleeves and get stitching! Joan is a collector of all things “Elephant” so I originally planned to make the organiser in an Elephant print that I previously bought from Fabricland. But disappointment – no more Elephant print in the Salisbury shop. 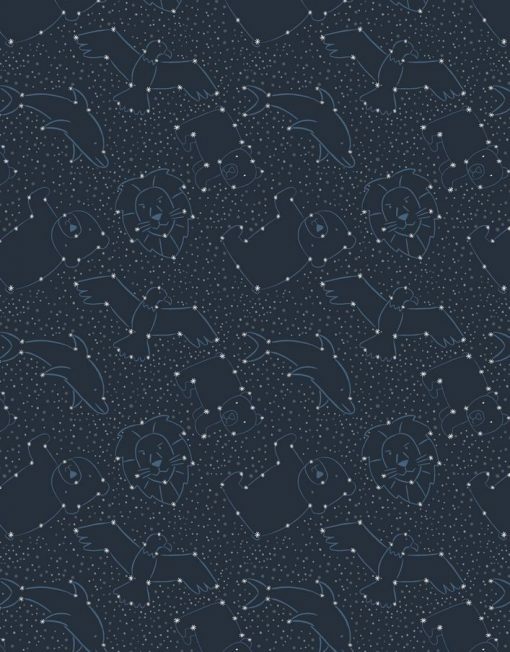 Instead I elected for an Elephant Grey background, printed with charming bouquets of flowers! 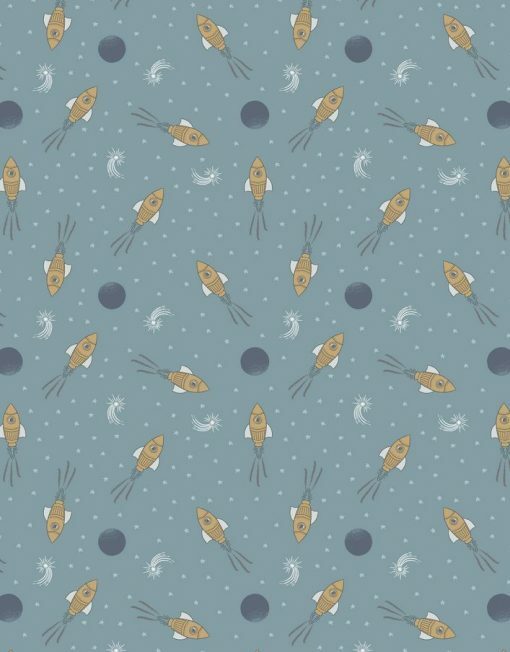 There was a co-ordinating Grey spot print and that is what I used for the project. Although I knew that I had some clear vinyl in my bag-making stash – it was out in the garage store, buried under a great pile of storage boxes. It was cold and dark in the garage, I did not stay long enough to uncover the vinyl – no problem, I would purchase another length from “The Range”. Again, disappointment – no plain clear vinyl to be had. 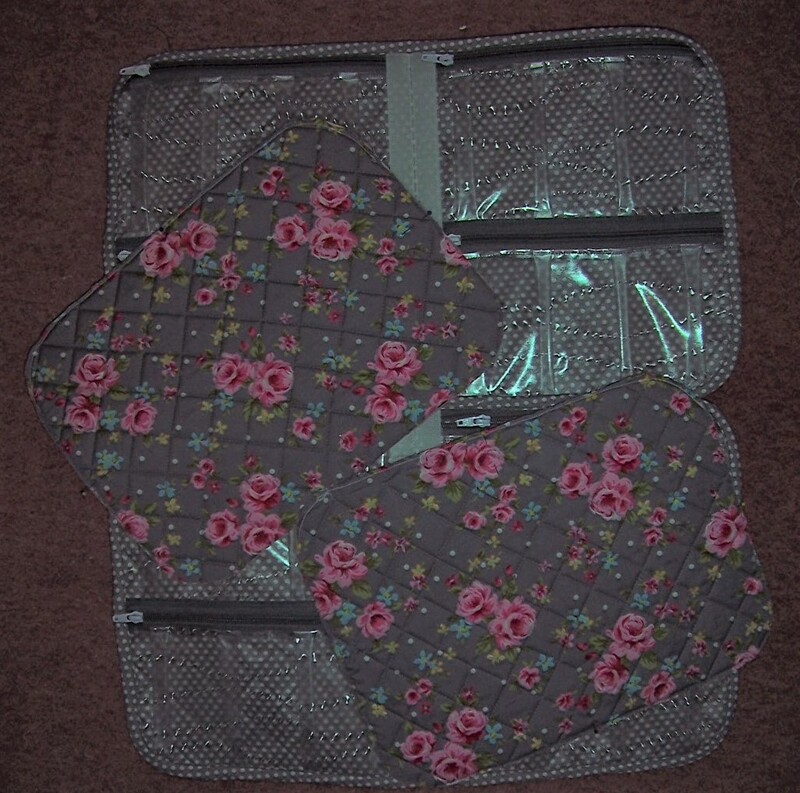 I purchased ½ metre of a simple patterned vinyl which I subsequently discovered was even better for stitching as being slightly embossed it was much easier to feed through the machine when making the pockets for the inside of the organiser. 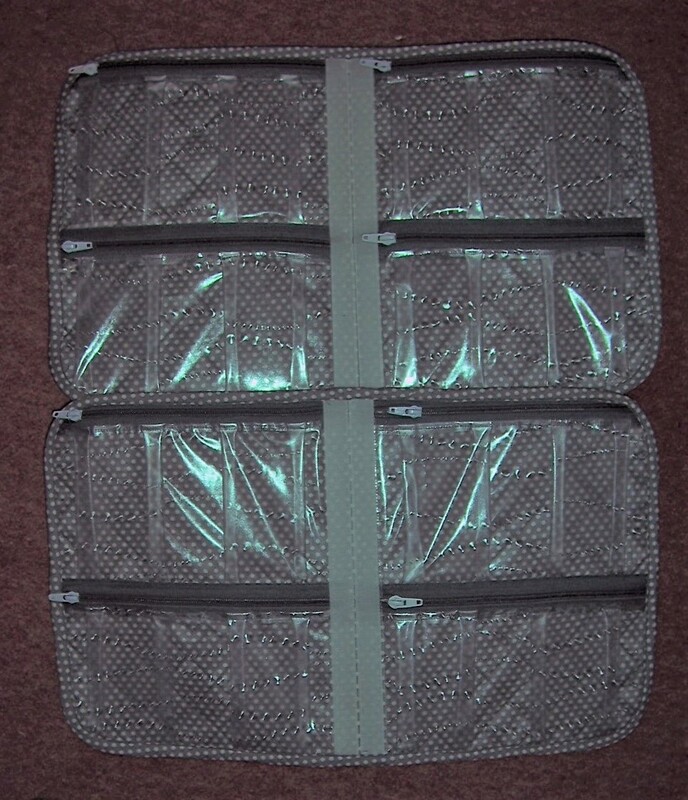 The mesh required for the outer pockets that are on the reverse of the outer front and back had posed a problem. That was until Adrienne suggested we buy laundry bags from Poundland. I cut the mesh from the bag which left the zipped bag still in one piece and the 2 mesh pieces were just the right size for the project. Result! First task was to check the dimensions of all the pieces and work out a cutting plan prior to quilting the various sections. 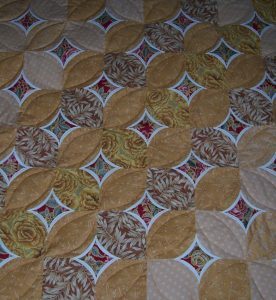 After 4 hours of quilting in a 1¼ inch square grid I had all the various sections prepared. Now to get making up the case. 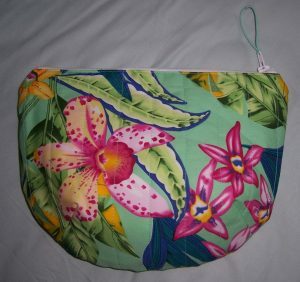 I had read through the written instructions and also watched the video on the Craftsy.com website. Having “set up shop” in the dining room, I downloaded the lessons to my tablet which I stood next to the sewing machine. 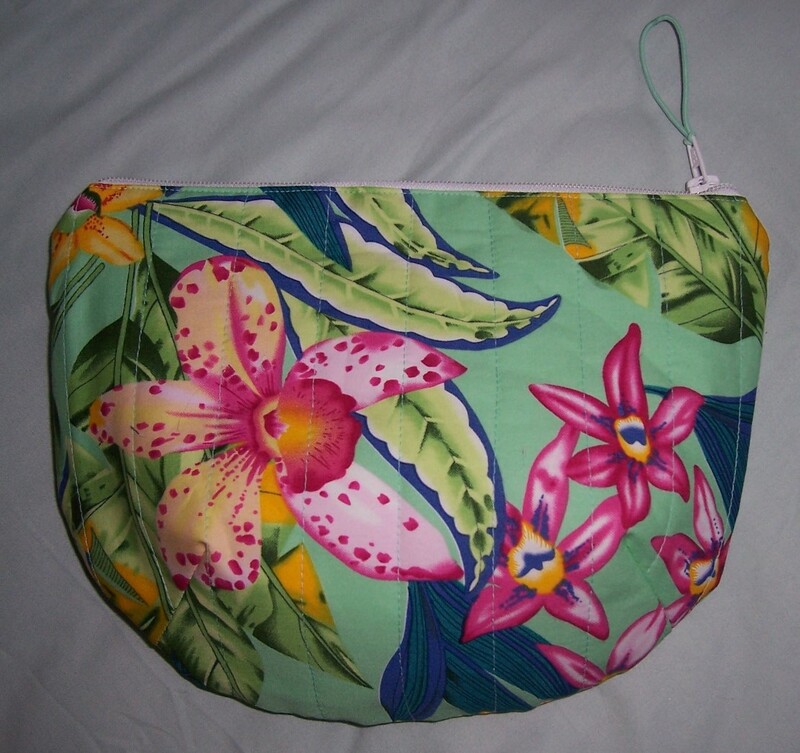 As each lesson was completed on the tablet, I undertook that same lesson on my sewing machine and gradually the project took shape. 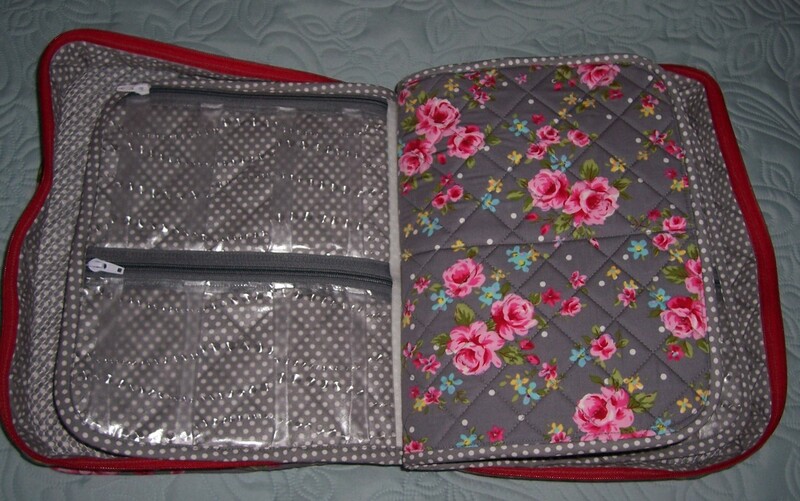 After three long sessions of stitching I had completed the Organiser. I am absolutely delighted with the result and like a Chinese meal, once finished, I immediately wanted to make another! Bag, packed and ready to go! 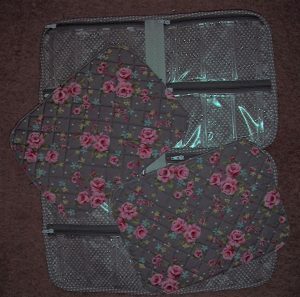 However, there are still several items that I want to complete before the end of the year, the second sewing organiser will have to wait. It has been our practice at Franklins P&Q class to exchange “Secret Santa” Christmas gifts. This year we did something different. Often at this time of year the local refuge sees an influx of women who arrive, sometimes with nothing more than what they stand up in. To help in a small way, we elected to sew some items to help. 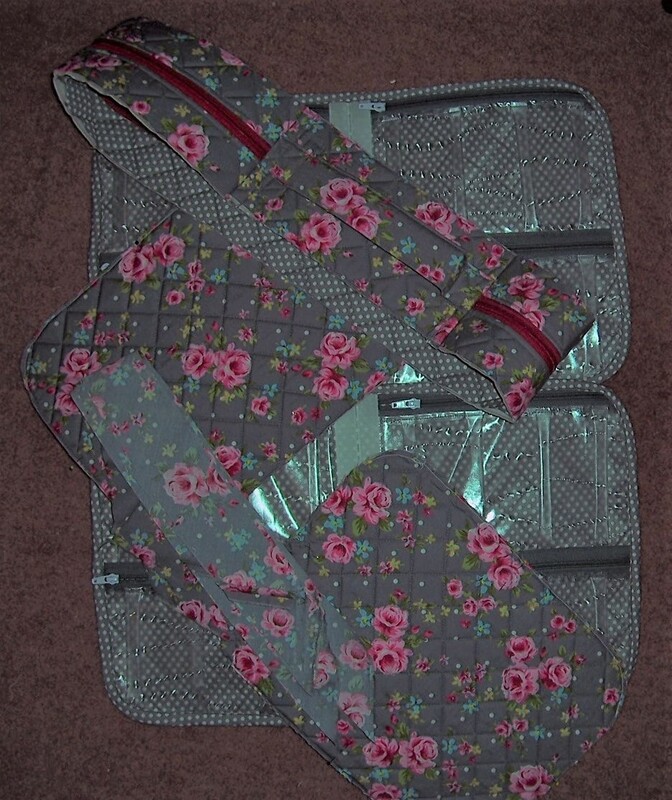 I made some toilet bags into which I put small items of cosmetics and toiletries, plus some cushions which will be placed in the rooms just to make the residents feel more comfortable. To make the bags I used remnants from previous sewing projects, lightly quilted to fusible wadding, lined with plain fabric, completed co-ordinating zip fastening and elastic loops on the zip pulls. I was pleased to see these remnants turned into attractive and useful items. Donations to the Refuge will be ongoing in 2017. In January we will each be giving a tube of toothpaste in a toilet bag as every little helps. 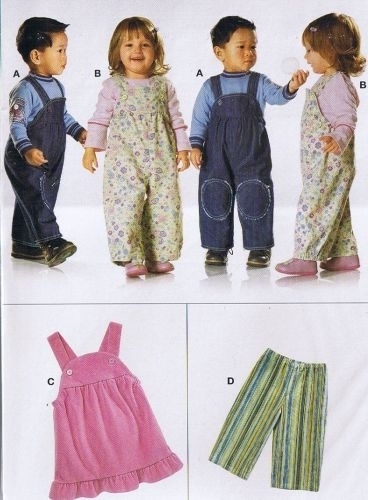 For several years now I have been corresponding with a “sewing friend” based in Germany. We have never met but have struck up a great friendship due to our shared interest in sewing in general and dressmaking in particular. Antje seems to favour jersey fabrics for her projects whilst I prefer woven cottons and linen. 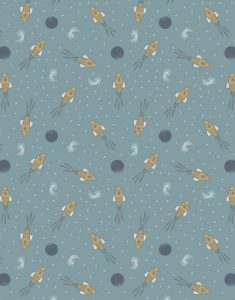 We do still sometimes buy the same pattern and it is always interesting and inspiring to see what and how Antje has been making. As Christmas was coming up I decided to send Antje a Christmas present – handmade of course! 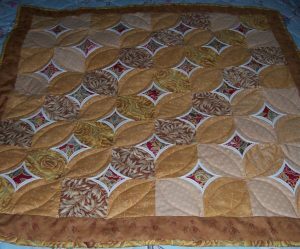 I recently completed an Autumn-themed quilt for my husband’s grand piano using a 3D-bow tie block which had the added interest of a faux cathedral window set into the ”knot” of the bow tie. I really enjoyed this block and as I had more fabrics in my stash in this colour theme I continued by making a lap quilt hoping that the colourway would compliment Antje’s décor. The quilt is made from 16 blocks each measuring approximately 9 inches square with an additional border and binding. 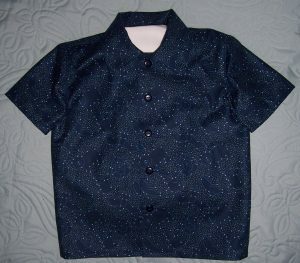 The wadding is a 2 oz polyester and the reverse is a Natural calico purchased from Lady Sew & Sew of Marlow. Quilting was done on my new Brother 550 Special Edition machine using a walking foot. 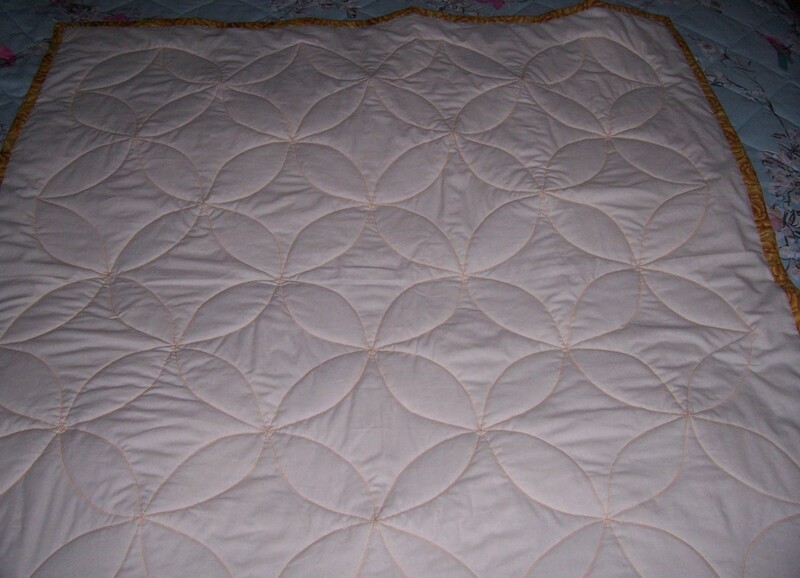 The quilting design is free motion interlocking circles. The quilt is completed with a machine embroidered label on the reverse that was stitched using my Brother 4000D sewing and embroidery machine. I enjoyed making the lap quilt and have gained considerable pleasure in being able to gift to my e-mail friend.